Magnify (February 7-9, 2019) is a chance to be a leader for God and learn to praise Him wholeheartedly. This event is geared to show youth from grades 7-12 that through true praise and worship, they can bring others closer to Christ. They will be taught ways to lead out in praise and worship through small group praise bands. Our goal is to train leaders so that they can pass the message along to others and to ultimately make it to heaven. Magnify is a music festival at its core. We take the time to train students in their main instrument and develop teamwork and leadership skills in a praise band setting. Over the course of the weekend, all student participants will have five rehearsal sessions to work with professionals and student music leaders of GCA. Pianists, percussionists, vocalists, bassists, and keyboardists will be placed together in small worship teams where they will practice, learn, and prepare to lead out in a worship service. During each rehearsal, students will be equipped with the knowledge of music leadership and expert clinician instruction. The breakout sessions will enable the students to get more one-on-one instruction in their primary instrument of focus. The session will be broken down by instrument type/voice. Guest clinicians are brought in to lead out in our breakout sessions. Pianists will be able to work with other pianists and instructors to help solidify and improve their skills. Percussionists will work with percussionists, and so on. 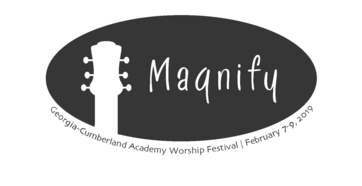 Magnify is not just a festival for learning how to play in a praise team. It is geared to the heart of worship. We reserve time for three general sessions during the course of the festival. Each session is geared to teach students how to lead worship and give them the tools to better serve the Lord.